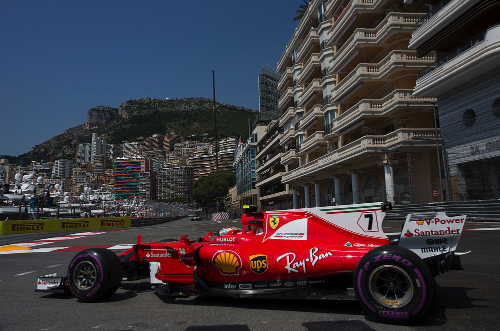 Kimi Raikkonen set a new lap record of 1:12.178 to win the pole for the Monaco Grand Prix. Lewis Hamilton, meanwhile, was eliminated in Q2 when he was only 14th quickest. The last time a Ferrari driver won the pole for the Monaco Grand Prix was Felipe Massa in 2008. It was also Raikkonen's first pole since 2008. The ambient temperature at the start of qualifying was 77 degrees Fahrenheit (25 degrees Centigrade) and the track temperature was 127 degrees Fahrenheit (53 degrees Centigrade). The lineup for the weekend was: Mercedes Lewis Hamilton and Valtteri Bottas; Red Bull TAG Heuer Daniel Ricciardo and Max Verstappen; Ferrari Sebastian Vettel and Kimi Raikkonen; Force India Mercedes Sergio Perez and Esteban Ocon; Williams Mercedes Felipe Massa and Lance Stroll; McLaren Honda Jenson Button and Stoffel Vandoorne; Renault Nico Hulkenberg and Jolyon Palmer; Toro Rosso Renault Daniil Kvyat and Carlos Sainz; Haas Ferrari Romain Grosjean and Kevin Magnussen; Sauber Ferrari Marcus Ericsson and Antonio Giovinazzi. As in FP3, Ferrari set the pace early in Q1, which lasted 18 minutes. But then Verstappen topped the times. Meanwhile, the Force India mechanics were racing to fix the car that Ocon crashed in FP3. He made it on track nine minutes into the session. Everybody was on Pirelli's ultra soft tires as Ricciardo got in front with a 1:13.219 and then Verstappen set a 1:13.078. With less than six minutes to go, Grosjean was 16th and on the bubble ahead of Stroll and behind Massa. Grosjean then spun at Mirabeau and nearly got collected by a Toro Rosso. The top five of Verstappen, Vettel, Raikkonen, Ricciardo and Bottas stayed in the pits in the closing minutes while most of the others tried to improve their times. Ericsson parked at the chicane. Car is broken, he radioed. When it was over, the five drivers who were eliminated at the end of Q1 were: Ocon, Palmer, Stroll, Wehrlein and Ericsson. Grosjean's last lap had pushed Ocon out of the top 15. The fastest 15 drivers who moved on to Q2 were: Verstappen, Vettel, Raikkonen, Ricciardo, Bottas, Vandoorne, Sainz, Perez, Magnussen, Hamilton, Button, Grosjean, Hulkenberg, Massa and Kvyat. Q2 lasted 15 minutes. Again, everybody was on the ultra soft slicks. Raikkonen clocked a 1:12.780, Vettel a 1:12.885 while Hamilton nearly slid into a barrier. Verstappen then took second place with a 1:12.788. Vettel, Bottas, Ricciardo and Vandoorne rounded out the top six. Hamilton was 14th with five minutes to go. Hulkenberg was 10th on the cutoff line with Perez ninth and Sainz 11th. Everybody but Raikkonen, who now had a 1:12.231, was on track with three minutes remaining. Hamilton had one last chance when Vandoorne hit the barriers at the swimming pool. That ended any fast laps, and Hamilton remained 14th! The five drivers who were eliminated at the end of Q2 were: Kvyat, Hulkenberg, Magnussen, Hamilton and Massa. The fastest 10 drivers were: Raikkonen, Vettel, Verstappen, Bottas, Ricciardo, Grosjean, Vandoorne, Sainz, Perez and Button. Q3 lasted 12 minutes. Vandoorne, of course, would not be taking part. Raikkonen got things rolling with a 1:12.296. Ricciardo was second, Vettel third, Bottas fourth and Verstappen fifth after their first laps. Bottas then moved to second, but Raikkonen improved to a 1:12.178. All nine drivers were on track in the closing seconds. Vettel took P2 with a 1:12.221. Bottas P3 with a 1:12.223, while Verstappen beat Ricciardo. Sainz, Perez, Grosjean, Button and Vandoorne rounded out the top 10. But Button and Vandoorne had penalties looming so would be pushed back down the grid.